Snydersville Raceway will be honoring our First Responders with the 4th Annual First Responders Night where all First Responders will receive a FREE PASS (ID/Badge or Uniform Required) for the Grandstands or Pits! Come represent your Unit, and Squad Cars, Fire Trucks, and Ambulances are Welcome and Encouraged!!! On top of that we have the Great Racing Action with a $300 TO WIN 50-LAP MICROSTOCK 206 CONE RACE to headline the evening. Plus we have a Regular Show of ALL CLASSES of Karts, Champs, Slingshots, and Quarter Midgets! 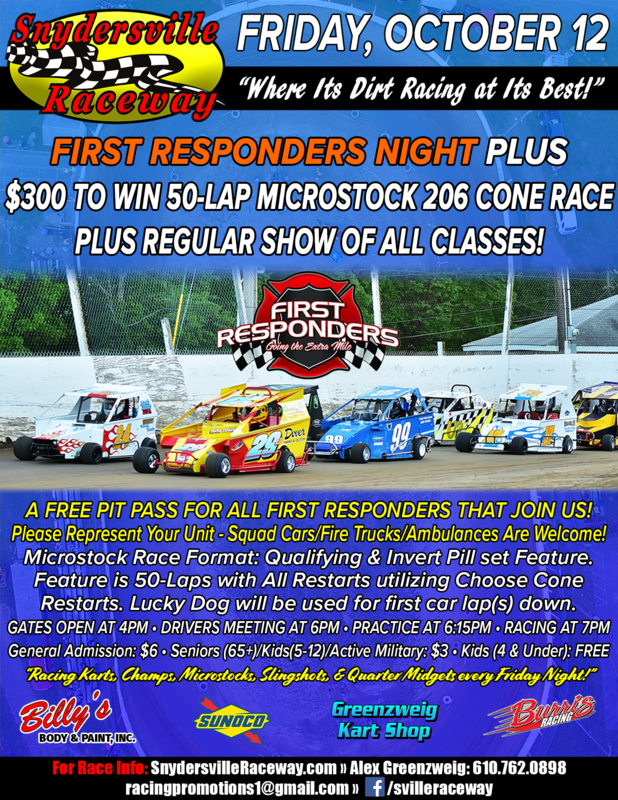 Come on out Racers, First Responders, and Race Fans to the 1/8th mile Bullring of the Poconos and Enjoy the Great Racing Action & Food at The Ville “Where It’s Dirt Racing at Its Best!” Gates open at 4pm, Drivers Meeting at 6pm, Practice at 6:15pm, and Racing at 7pm. See you all at Snydersville! • FUEL RULE- Drivers must use Sunoco 87‐octane fuel from: 4300 Manor Drive/Middle Easton Belmont Pike Stroudsburg, PA 18360‐9496. Fuel must test within +/‐10 points on the Fuel Tester. Snydersville Raceway uses Sunoco 87-octane fuel from the specified gas station to zero the Fuel Test Gauge.